"And I want to inform you that a referendum will take place. It will take place when we put the issue in detail. Because joining the European Union is impossible without a referendum. First, an application for entry is submitted when we meet criteria. A referendum is held not on joining or not joining [the European Union], as the people had already decided… The question at the referendum will be whether the Ukrainian people are ready to delegate some of the powers to a supranational body, as 27 or 28 EU members did", Poroshenko said. The president added that accession to the European Union and NATO would strengthen independence guarantees for Ukraine. The Ukrainian President has also touched upon Donbass, saying that he would start a political process in the eastern regions if he wins a second term next week. "Peace is the first thing I want to bring after winning the presidential election. It is the start of a political process in Donbas, while our country preserves its unitary nature and restores its territorial integrity," Poroshenko told Ukraina channel. Speaking about the upcoming runoff in Ukraine, Poroshenko said that if his rival, presidential candidate Volodymyr Zelenskiy, won the presidential election, he would respect this outcome, as this would be the Ukrainian people's choice. "If God forbid, he is elected, it will be the choice of the Ukrainian people, and I will respect any choice because we are a democratic state", Poroshenko stressed. The first round of the Ukrainian presidential election was held on March 31 and resulted in none of the candidates gaining the absolute majority needed to win the race. 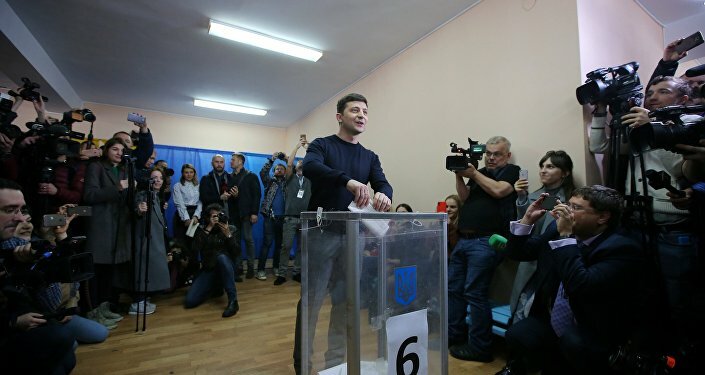 Zelenskiy led with 30.24 percent of the vote, while Poroshenko came second with 15.95 percent and will, therefore, confront Zelenskiy in the runoff. Ukraine relinquished its status of non-affiliation with any blocs in 2014 and has since then been striving to join the European Union and NATO. The president signed on February 19 a law enshrining these aspirations in the Ukrainian constitution. Ukrainian membership in the European Union and NATO is the key message of Poroshenko's election program, titled the "Great State of Free and Happy People".